Washington (Agenzia Fides) - Dozens of heads of churches in the United States sent a letter to US Secretary of State Mike Pompeo expressing concern over the 'Properties Bill,' which has recently been advanced in the Knesset. "Jerusalem Patriarchs and Heads of Churches" reads the letter "consider this legislation to be an existential threat", and this concern "cannot be overstated". The letter of the heads of the US churches to Pompey also recalls that last February, when the bill was submitted for the first time to the attention of the Knesset, the Heads of Churches of Jerusalem protested by closing the Church of the Holy Sepulchre in a historic act of solidarity for three days (see Fides 28/2/2018) to denounce the "systematic campaign against the Churches and the Christian community in Holy Land, in flagrant violation of the 'Status Quo'", attributed to the Israeli authorities. At the center of the controversy there are ecclesiastical real estate properties that in the past had been rented for long periods - up to 99 years - to the National Jewish Fund, and that in recent times the same ecclesial subjects, in order to cope with their debts, sold to large private property groups. But in recent years, in order to erase massive debts, the same ecclesial subjects has sold vast swaths of real estate to private investors. The Israeli Parliament has long been working on a bill to guarantee the State of Israel the possibility of confiscating such lands and real estate, taking them away from possible property disputes, especially to protect the interests of current tenants. 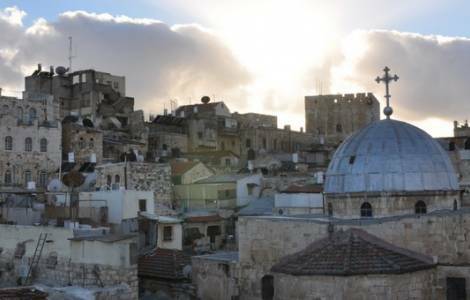 In February, the Israeli government announced it would seek together with the Christian Churches present in the Holy Land shared solutions to overcome the points of contrast. The negotiation was suppose to be entrusted to a committee chaired by Tzachi Hanegbi, Israeli minister for regional cooperation. After almost nine months, the Christian exponents who signed the letter called on Pompeo to work with Israeli leaders to "ensure that this bill is halted permanently".